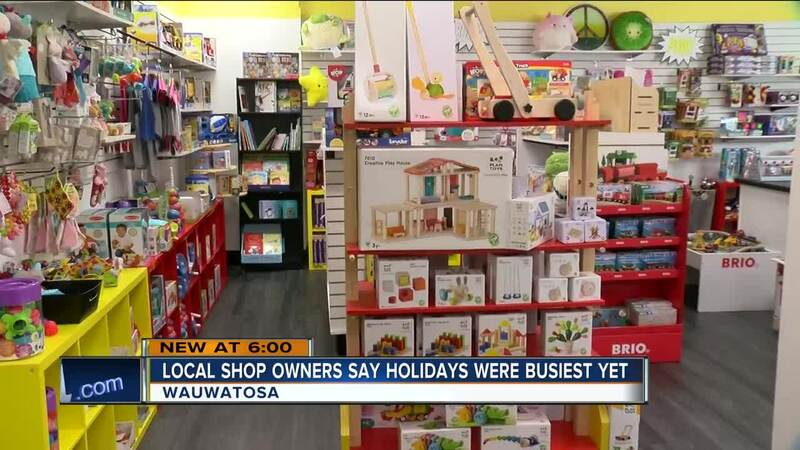 With big retailers pulling in record sales numbers this holiday season, small mom and pop stores have had to get creative to compete for business. At Rukus & Glee, toy store owner Matthew Poulson's said business was great for his shop this season. "Last Saturday right before Christmas was one of our busiest days of all time. It was crazy," said Poulson. The store is filled with toys for kids of any age. They focus on letting the customer try out the product before the purchase. "We provide the best customer service possible that's what makes us different from Amazon. You won't get that at Amazon and we let you try the toys. We want the kids to try to toys before they are purchased," said Poulson. As an added incentive, they also offered gift wrapping for customers this year. "Just those little perks and good customer service and hands-on treatment that makes people want I come back," said Poulson. Over at Salamander, sales associate Mary Kramer said to set themselves apart, they offer unique products like winter coats from Spain. She said the key to retaining customers is to give them a personal one-on-one experience. "It's almost like a personal shopper because we really enjoy what looks good on them. There is a lot of variety here," said Kramer.